You can click on the picture above to be transported directly to the magic and beauty of The Big Island of Hawaii. My island home. But, if you have the time please browse on down this page and see some of the interesting, informative and moving links I have discovered while wandering through the facinating world of the Internet. You can access my homepage from the table below also. Sissi is a wonderful lady who was involved in a serious car accident in August 1997. In spite of her meraculous progress she still faces a long road to total recovery. Please keep her in your thoughts and prayers. If you have a webpage you should check this site out, and then Join this campaign. If you have an uncontrollable urge to HELP someone who needs your support, be my guest. This link will, explain why this is so important. By clicking on this banner you can find out how to battle bandwidth theft.. Please carve your initials on my palm tree. See what others have carved. This Hawaiian Ring site owned by Donald Schutte. This page last updated on August 8th 2000. Aloha! 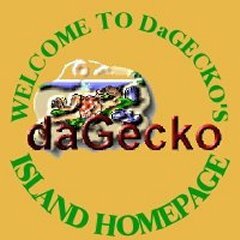 You are hit number on DaGecko's page, Mahalo!